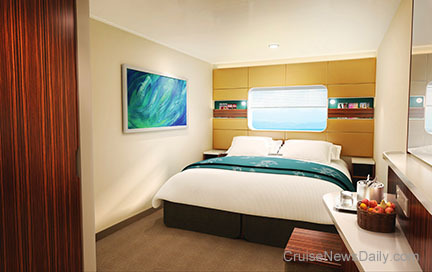 Norwegian Cruise Line released information and renderings of the balance of the cabin types that will be available on their two Project Breakaway ships, set to be delivered in April 2013 and April 2014. 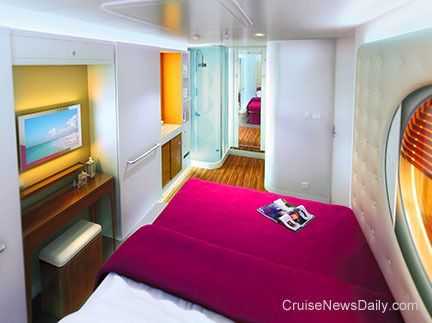 These are the types of staterooms most passengers will occupy. The popular Studio for single travelers which debuted on Norwegian Epic will be brought back on the Project Breakaway ships (above). The very small-sized inside staterooms feature a full size double bed and a compact bathroom. Passengers choosing the any of the 59 staterooms in this category will also have access to a private lounge which increased their living space and enables them to meet other passengers traveling solo. The ships will also have larger inside staterooms (above) of a more conventional design which accommodate passengers traveling together. 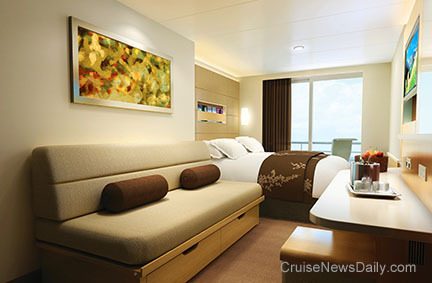 There will also be 158 similar outside staterooms with a large picture window above the bed (above) but no balcony. For families needing more room, Project Breakaway will have 42 Family Oceanview staterooms that sleep up to five and have a larger bathroom and more closet space. For those who are aboard to relax in the spa and want to bring that atmosphere into their stateroom, the Project Breakaway will have 28 Spa Balcony staterooms (above) with special amenities and decor located adjacent to the ship's spa. 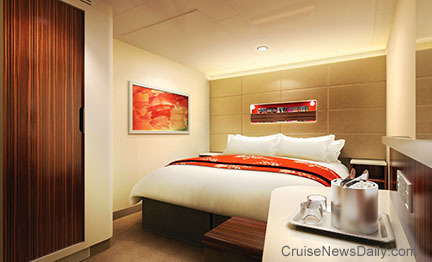 For customers who need a little more space, the ships will also feature 20 Spa Mini-Suites (above). Passengers in the Spa accommodation type will also have complimentary access to the Thermal Spa Suite during regular spa hours throughout their cruise. 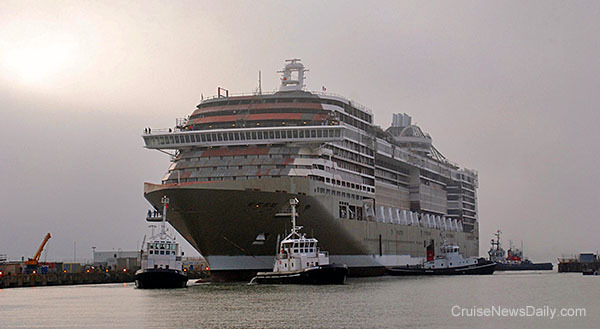 The construction phase of the building of MSC Divina ended on Saturday (September 3, 2011) when it was floated out of the building dock at the STX France yard in Saint Nazaire. 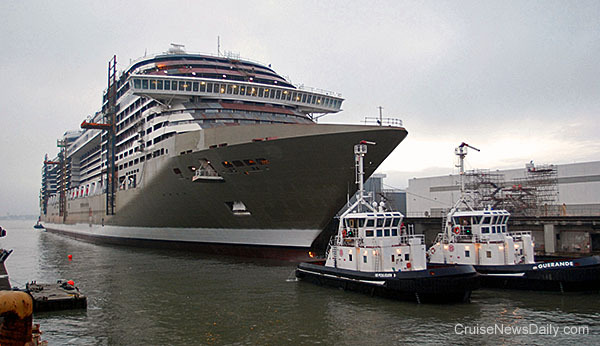 The ship was towed to a finishing dock at the facility where interior work will continue until it is delivered in May 2012. The ship is the third in the 140,000-ton Fantasia class, but contains 100 additional staterooms and some new design elements. This short time lapse video shows the final block (the bow) of Disney Fantasy being put into place at the Meyer Werft yard in Papenburg, Germany on September 3, 2011. 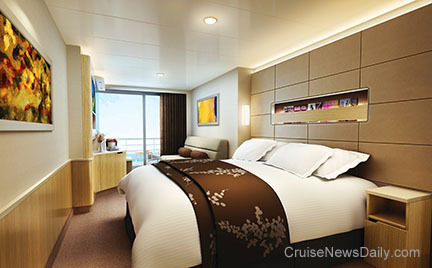 Disney Fantasy is a sister to Disney Dream set to be delivered in March 2012.